It’s a frigid cold morning in the Seattle area, but beautiful. The sun is up this morning and everything is covered with snow and ice. The last three school days before the Holidays were cancelled due to the icy weather, and another snowstorm is on its way. BUT, the weather people are also predicting those terrible Northwest winds for later today and tonight. Noooo! I promise I won’t complain about the ice and snow anymore. I won’t moan and groan about the cold temperatures. But please don’t let it get windy! We’re all still traumatized by the Hanukkah Eve Storm of 2006, which caused widespread power outages and lots of property damage. We were without power for three days that time, but our daughter was without power for 8 days (I feel so sorry for the people in the Northeast without their power still!!). So we don’t want a repeat of that vicious windstorm, and we don’t want to be without power for days and days. Cross your fingers! Please! This entry was posted in Home, Life on December 20, 2008 by Robin. Oh, dear. I’ve been so wrapped up (literally) in our two feet of snow I didn’t stop to think about you folks to the west who have your own troubles to deal with. Just a few inches of snow go a long way in Seattle with all those hills. And wind! I hope you do ok and will be watching here for more news. I’ve been thinking of you, Mary, every time they show those snowplows in Spokane on the news!! I hope things settle down (and melt a bit) for you soon. And for us, too! I just found your blog last night and I’m also a book blogger in Seattle! Honestly, we are clearing out of the house for two days. I can’t stand to be here during another big wind storm. We lost power for 7 days! The smallest mention of wind brings me incredible stress now. We still haven’t cleaned up all of the 20+ trees that fell on our property last time. Blah. Traumatized, huh? LOL Well, I hope you don’t go through that, again. We routinely lose power during storms and it’s miserable in both summer and winter. I can’t imagine surfing the waves in a car! 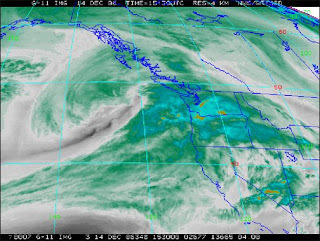 That wind storm looks horrible. Hope it isn’t so bad this year. We were without power for a week after Hurricane Ike ripped through our town and it was bleak. I never stopped to think that cold weather could cause power outages. The snow looks so beautiful on tv. I hope it doesn’t get bad! Hi Kristen M. It appears that we missed the windy part of this storm last night! The wind wasn’t too bad here, and I hope it was the same for you. I completely understand “clearing out of the house for two days”! It’s all these tall trees that are so terrifying for us. We have greenbelt on both sides of our house, and it’s completely unnerving to be here during a windstorm! Thanks, Bookfool! It’s not the power outages that are traumatizing here (although they’re a major PAIN! ), but the high winds with all these tall trees. During one windstorm in 2003, I stood at our back window and watched very tall trees in the greenbelt behind us snap in half, or the top part break off and crash to the ground. And our friends had a huge tree fall on their house. We all suffer from post traumatic windstorm stress! 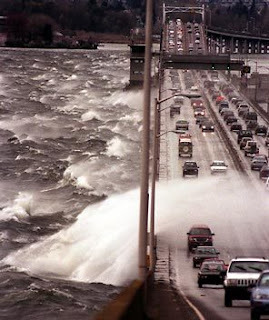 Thanks, Booklogged, that news photo of the waves over the bridge really shows the power of our windstorms. They actually close the bridge when the wind gusts get a little bit stronger than that. It sways and moves while you’re driving on it. Eerie!! And all of us living here remember the windstorm of 1990 when the other bridge across Lake Washington broke and sank! That was amazing to see! Hi DebNance, it IS beautiful out there! It’s not the snow and cold that’s hard on us — we are prepared to deal with that for an extended period of time, although it’s not fun. It’s the damaging winds we’re afraid of! I can’t imagine going through a hurricane!! Thanks for crossing your fingers, Nymeth! It must have helped because the high winds didn’t get to us last night, despite all the dire predictions. Thank goodness!